As we say goodbye to the long days of summer, we welcome back-to-school routines and structure. This was a memorable summer for our family. Here are a few of my favorite things that I’ll miss. 1.) Camp adventures – I loved hearing about all of my daughter’s camp adventures, whether it was a field trip, music, art or another wild adventure – camp kept her busy! 2.) Staying up late! We started giving our daughter more one-on-one time at night after her brother went to bed. She’s taken to Double Dare (um, hello! It’s back in full force!) She thinks it’s a hoot and we love reliving the physical challenges with her! It’s kind of become our thing at night. 3.) Sprinklers in the sun. 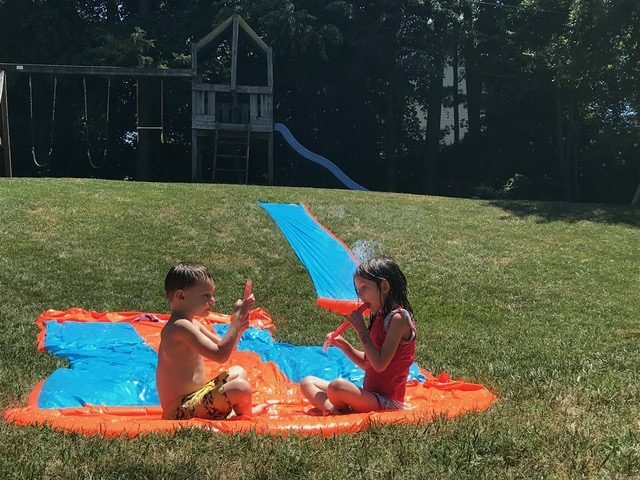 We have a great backyard that got soaked with sprinklers, slip ‘n slides, super soakers and hose fights. My son became the master at soaking us all! It was a blast to say the least! 4.) Family, family and more family. Whether it was the memorable 12-hour car ride to visit family in Indiana or our family visiting the Midwest or Florida, it was great to get some quality time with family members, a couple that our kids hadn’t met yet! 5.) Playing in the rain. We had some real soakers here in the Queen City. 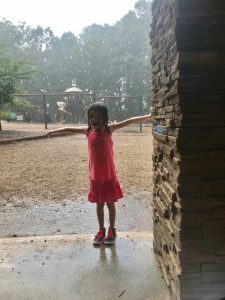 I remember how awesome it was to play in the rain as a kid and loved watching my daughter laugh out loud as she jumped in the biggest puddles. As summer comes to an end, we’re looking forward with anticipation to going back to school. For some reason, it feels legit this year with her going into first grade. More structure, more rules, more expectations, but also more opportunities and more amazing things to learn. At the same time, this will be my son’s last year as a preschooler. I’m excited, just as he is, but also a little sad, as I see my “baby” grow up to be such a fun and smart little boy. In addition to our daily school routine, we’re excited about joining soccer teams again with the YMCA and continuing our swim lessons at Little Otter Swim School. 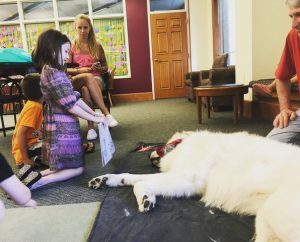 We also started a new routine of going to the local public library every Saturday morning and reading books to service animals which we all have really enjoyed! Let’s welcome this year with open arms. Smarties, what are you sad to say goodbye to from this summer? What are you most looking forward to this school year?